Rachel Bertsche’s memoir about her innovative approach to finding a new best friend will keep you laughing, cringing with sympathy embarrassment, and nodding along in recognition of your own thoughts put to paper. Having moved to Chicago to be with her husband, Bertsche left her two childhood best friends in New York City. After three years of work, mild acquaintances, and loneliness, Bertsche decides to do something about her lack of a local best friend. MWF Seeking BFF centers around Bertsche’s hunt for 52 girl dates. 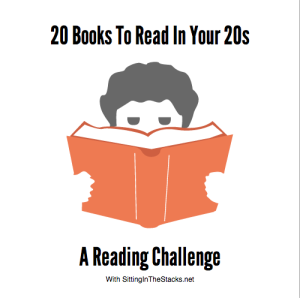 Bertsche confesses over 340 pages the anxiety, fears, and truths of all 20-something women moving to a new city where they know practically no one. Having moved myself three to four times in the three and half years since graduating from college and facing a cross-country move in a few months, I appreciated Bertsche’s reveal all, no topic is too taboo approach. This was a GREAT addition to the 20 Books to Read in Your 20s challenge! It’s difficult to classify Bertsche’s book. Is it a memoir? Is it self-help? Why not both?! Unlike other self-help books that read like an overly optimistic lecture, Bertsche lives her advice. From her awkward to-hug-or-not-to-hug first friend date dance to the possibly creepy experience of rent-a-friend, Bertsche helps by example in MWF Seeking BFF. Bertsche does not take the easy way to meet friends, emphasizing that part of meeting new people is changing your through process. Throughout the book Bertsche notes that the “old-Rachel” would have not begun a conversation with a stranger at an airport gate or chatted up the familiar girl in yoga class. In both those cases the “old-Rachel” would have missed an opportunity to meet, and possibly befriend, a great new person. 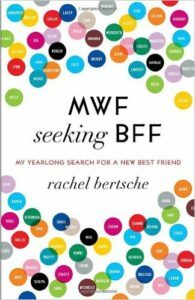 What Bertsche demonstrates in MWF Seeking BFF is that we’re not alone in our search for a best friend. If you’re looking to make a new friend that’s probably a dozen other women wanting the same thing. Friendship may not be as easy as walking up to a kid on the playground or sharing your pudding snack at lunch anymore, but it’s not all that complicated either. One of the best aspects of Bertsche’s writing is that she doesn’t side-step the uncomfortable. She shares all the socially awkward occasions she experiences. My favorite moments of honesty are Bertsche’s confessions that she fears she’s coming on too strong. There are times when Bertsche really likes her friend date and wants to dive right into good-friend material, but then worries she’ll scare off a potential BFF. But Bertsche’s story provides hope and support that there is someone out there with your same brand of weirdness who will be just as excited to be your new friend as you are theirs. Sometimes you just have to embarrass yourself, be authentic, and keep on trying even after the bad friend dates. Eventually you will find someone to call up spur of the moment to chat or hang out and you will find that person who compliments your goofiness with their own. You will find that new person you ask, “Why do I have five jars of pickles in my fridge,” as Bertsche often asked herself as the barometer for a new friendship. With witty observations and extensive research about the psychology of friendship, Bertsche offers an honest look at the difficulties of finding a new best friend in adulthood. MWF Seeking BFF should be required reading of all women graduating college or any lady moving to a new city. Bertsche’s hunt for a new friend was a great read and definitely provided me with some tips and tactics for my new friend hunt when I move in July.